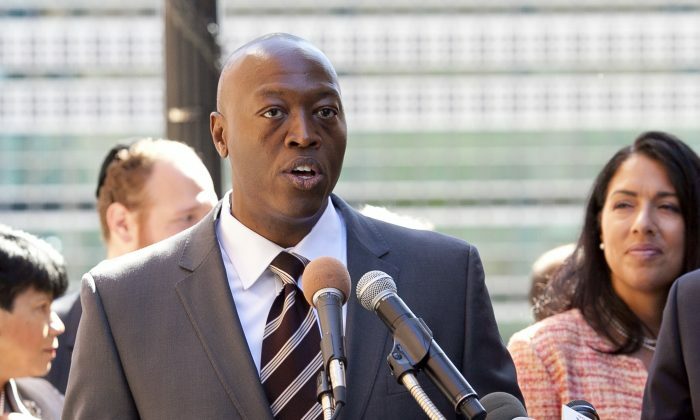 NEW YORK—The final comptroller debate, which was to take place on Oct. 24, was canceled by the Campaign Finance Board (CFB) after Republican candidate John Burnett failed to qualify. To participate in the second debate, a candidate must have raised and spent $200,000, but the fundraising threshold can be lowered to $25,000 if a candidate receives at least 10 percent in either a Marist or Quinnipiac University poll. Burnett has raised $23,414 and spent $31,943, according to the latest CFB filings. As of press time, Marist, nor Quinnipiac, has conducted a poll for the comptroller race during the general election. According to CFB rules, if no poll is conducted, the fundraising criteria will be the only method used to determine eligibility. On Sunday Burnett released a blistering statement condemning the CFB. Burnett took particular exception to one of the requirements being the polling, something he argued was ridiculous based on the fact the CFB does not conduct them. Independent mayoral candidate Adolfo Carrion Jr. was left out of the recent mayoral debates for not meeting the polling requirement. He only received two percent in the polls. The Epoch Times reached out to the Stringer campaign for comments, but it did not return an immediate request for comment.